Gravity, Lift, Thrust and Drag. Gravity is a force that is always directed toward the center of the earth. The magnitude of the force depends on the mass of all the aircraft parts. The gravity is also called weight and is distributed throughout the aircraft. the Center of Gravity (CG). This is the point about which an aircraft would balance if suspended on it. the weight force always remains toward the center of the earth. This force is obtained by the motion of the aircraft through the air. Where the Lift Force is in Newton, Wing Area in m2 and the airspeed in m/s. The standard density of the air is 1.225kg/m3. angle of attack (AoA) before reaching the stall angle. Thrust is the force generated by some kind of propulsion system. Gliders are always descending relative to the air in which they are flying. Drag is the aerodynamic force that opposes an aircraft's motion through the air. Drag is generated by every part of the aircraft (even the engines). The skin friction causes the air near the wing's surface to slow down. This slowed down layer of air is called the boundary layer. toward the wing trailing edge. fly, the thicker the boundary layer becomes. Form drag is another source of drag. This one depends on the shape of the aircraft. As the air flows around the surfaces, the local airspeed and pressure changes. motion is the wing's lift. Induced drag is a sort of drag caused by the wing's generation of lift. turn results in swirling vortices being formed at the wing tips. The induced drag is an indication of the amount of energy lost to the tip vortices. overall lift coefficient of the wing. The picture below shows the downwash caused by an aircraft. 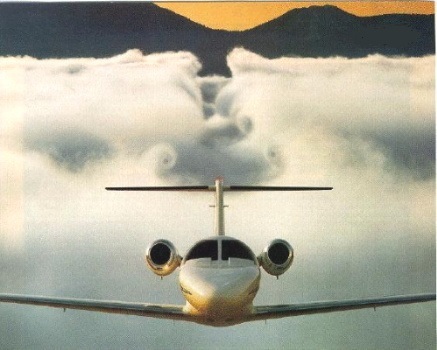 The Cessna Citation has just flown through a cloud. The downwash from the wing has pushed a trough into the cloud deck. The swirling flow from the tip vortices is also evident. wing with a large chord (low AR) has high-induced drag. at lower angle of attack (AoA) than the wing with a low AR. Also, aircraft with high AR wings are more sensitive to elevator control. being generated and it's proportional to the square of the angle of attack. the same lift, the slower the airspeed is, the greater the induced drag will be. So, the induced drag is also inversely proportional to the square of the airspeed. With drooped or raised wing tips, the vortex is forced further out. added to the wing tip. An easier and lighter method is by cutting the wing tip at 45-degrees. sharp top corner and is pushed outward. of the drag on an airplane. to meet gradually rather than abruptly. The graph below shows the induced and the parasitic drag versus airspeed. Total drag is the induced drag plus the parasitic drag. the graph also shows how much thrust is needed at different level flight speeds. which increases the total drag and also the thrust needed. total drag starts increasing exponentially (and so does the thrust needed). max thrust available, which altogether means by the max power available.